On vacation in Alaska a couple of weeks ago, my family and I got acquainted with the history of a small town called Skagway. Skagway doesn’t look like much - it has a population of less than 900, and one main street lined with shops. But 900,000 people a year come to Skagway. It’s a port for cruise ships, and thousands of people crowd the streets, shops, and restaurants every day during the tourist season. That’s reminiscent of how Skagway got its start as a town. It sprang up almost overnight because of its location near what became known as the White Pass through the Coast Mountains. Gold was discovered in the Klondike in 1896, and by July of the next year the first boats were docking at what would become Skagway. As many as 30,000 people, most of them prospectors, were in the area at any one time after that, using Skagway as a staging area before beginning the 500 - mile trek through mountains and down the Yukon River to the gold fields. 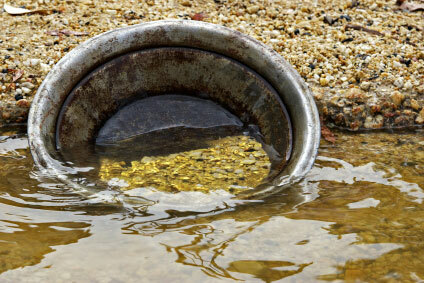 For the average prospector, it would cost $1200 just to get to the Klondike, with no guarantee that they would find gold. (It’s since been estimated that more money was spent to get to the gold fields than was actually brought out in gold.) Many prospectors mortgaged their homes to make the trip. The Canadian government required that all prospectors bring a year’s worth of supplies with them over the pass from Skagway: about a ton of supplies for each. Most of them would have walked the forty mile Pass thirty times or more over a three-month period, bringing their supplies over in stages. A considerable number of the prospectors died in their quest to strike it rich. It’s easy to look with amusement on people from a century ago who staked so much on embellished reports of the Klondike as a place where they could pull giant gold nuggets out of creeks. It’s easy to wonder what made them give up so much, pay such a cost, and make such a difficult, dangerous journey. But a moment’s thought, and you have the answer, don’t you? Jesus said it this way: “Where your treasure is, there your heart will be also.” (Matthew 6:21) The fact is, human beings have been proving that true since - well, since Eve first noticed how good that fruit looked, I guess. We’ll do whatever it takes, pay whatever it costs, endure whatever we need to endure, to finally get what we value most. Sometimes we call that greed. Sometimes we call it dedication. The difference, I suspect, is in the object of our desire. And maybe our reasons for wanting it. Jesus had one main talking point; he came to describe the kingdom of God, and to invite people to enter it through him. The church has come to understand “the kingdom of God” in two ways: we’ve defined it as the church while we’re on earth, and as going to heaven after we die. But that wasn’t really what Jesus meant. Or, at least, not entirely what he meant. It was more of a subversive proposition for Jesus, an invitation to people who were living under the Roman Empire, King Herod, and the Temple hierarchy to align themselves with God’s kingdom instead. In calling them to be a part of this kingdom, that the Jewish scriptures had always promised would bring all earthly kingdoms to nothing, Jesus was inviting them to claim their share in the life God wanted to give them. But he recognized that, just as surely as God’s kingdom couldn’t ultimately coexist in the world with any other, neither could it coexist with another kingdom in a human heart. It requires those who would enter to exchange the value systems, priorities, and affections of a dying kingdom for new ones. There is no room for conservatism in the Kingdom of God. That’s not as much a political statement as it is a philosophical one. We can either hold on to old values, old priorities, old treasures, or we can let them go and follow Jesus toward the treasure of God’s kingdom. The man in Jesus’ parable couldn’t hold on to what he had and still hope to gain the treasure he’d discovered in that field, no more than Klondike prospectors could simultaneously search for gold and sit at home warm and safe and comfortable. Before he could own that treasure, he had to first be willing to let go of everything else. The church’s reinterpretation of the kingdom of God has often been as deceiving as it is self-serving. It lets us define being a part of the kingdom of God as baptism or participation in some church. Or it lets us push thoughts of the kingdom out of real, this-world implications about our time, money, and values and out into the next world. (Where they won’t bother us or complicate our lives for a while.) But neither of those understandings of the kingdom of God have much in common with what Jesus meant, and you can tell because neither makes us choose between the treasures we have in our hands and hearts and the treasure that God offers us. Whatever kind of kingdom those views describe, they’re “both/and” kingdoms. Jesus describes the kingdom of God, without apology, as “either/or.” That’s why he couldn’t talk about the kingdom without talking about what it cost those who would enter it. He didn’t just talk about it, of course. The cost of the kingdom of God was no different for Jesus than it’s ever been for anyone who’s ever entered it. It forced him to let go even of equality with God and to become a man. And then to let go even of that life in suffering and death. What the kingdom requires, then, Jesus was willing to pay himself. And in doing so, he showed us that the treasures all around us that men and women give so much for, treasures that will crumble to dust in our fingers, are not worth what we’ve been too willing to pay. Jesus calls us to re-evaluate what matters most to us, what we’re giving ourselves up for. The treasures of this world’s kingdoms are certainly bright and glittering and attractive. Their temptations lead many of us to waste our best years and give up the best parts of ourselves. He calls us, though, to give up those futile treasure hunts. He calls us to give up everything we have, but only for the treasure that really matters, the one that will outshine all the others. The one he suffered and died to give us. The life God has always wanted us to live with him.